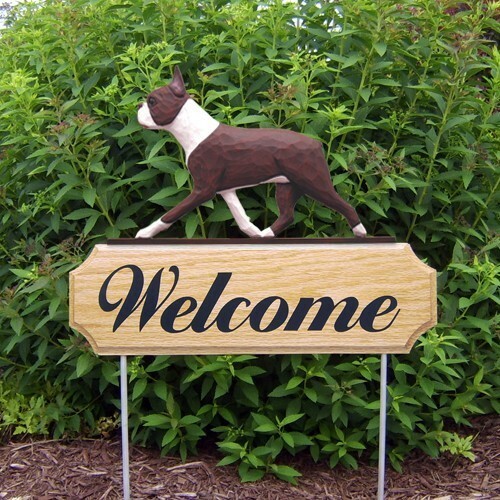 Show the love of your favorite dog breed with this beautiful "Dog in Gait" Welcome Sign Garden Stake. This beautiful dog breed resin reproduction is cast from an orginal wood carving by our Master Woodcarver Michael Park. Dog breed is hand-painted and hand-finished. Mounted on a solid oak sign. Sign measures 4 1/2" x 15". Dog measures 11 1/2" in length. Two aluminum rods measures 1/4" x 16" each in length. Ships direct from Mfg. Please allow 10-14 days shipping. Order prior to December 1st to insure Christmas delivery.